Card is popular packaging material because it is cheap and it can be recycled. Also, colour and images can be applied using a number of printing techniques. Normally the card is lacquered to give the box a gloss / satin finish. Often the packages are cuboid in shape as this means that they can be transported and stacked on shelves easily, efficiently using space. Opposite is a ‘development’ / ‘net’ of the packaging of a perfumed product. Packaging for almost any product is made in multiples. 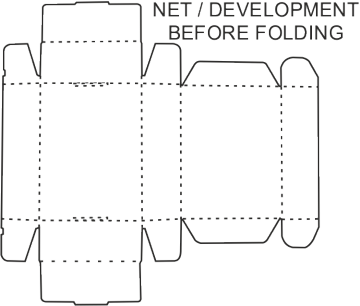 The only time a single package / net is manufactured is usually when a prototype package is required, so that it can be tested and improved. In industry a large, single sheet of card will be used to manufacture many individual developments / nets. 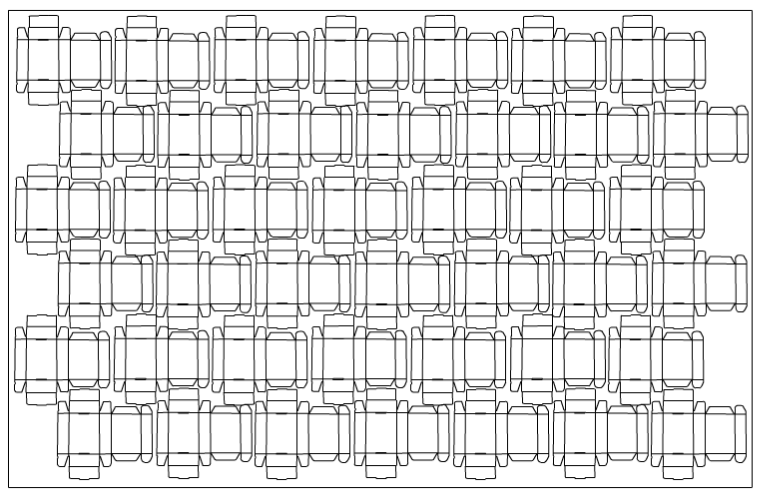 The diagram below is a typical layout. It shows multiple nets of the packaging, printed out on a single piece of card. This reduces waste and is a cost effective way of manufacturing packaging. The packaging has been arranged as multiple nets, with very little space between each one. This arrangement of shapes is called a tessellation. A tessellation is a shape that is repeated over and over again without creating gaps or spaces. A Tessellation is sometimes called ‘tiling’. In industry it may be necessary to make thousands of the same type of package. In order that materials are not wasted, the developments / nets are organised on the card in such a way that there are only small gaps between each individual shape. Special cutters are pressed into the material to stamp out the nets / developments, which are then folded by machines to from the packages.